JoJo is a male Atlantic Bottlenose Dolphin. Dean and JoJo first met when Dean visited the Turks and Caicos Islands. There are few dolphins in the world that are known to seek out the company of humans and JoJo is the most unique and famous of them. 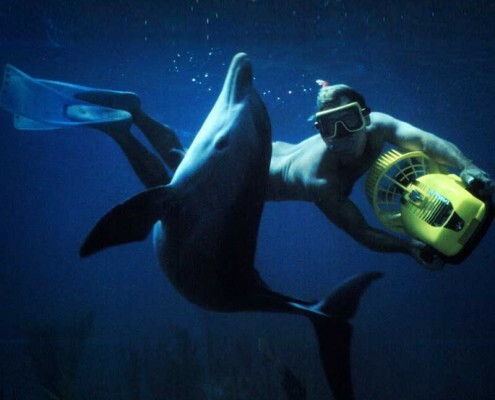 Because of JoJo’s interest in spending time with humans he is known as an ambassador dolphin. Dean and JoJo’s relationship is the longest lived human-dolphin relationship in recorded history. Dolphins like JoJo grow to eight feet long and are thought to live to forty to fifty years old. JoJo has a female mate that Dean named Chenoa and together they have two offspring that Dean named JoJo Jr. and MoJo. 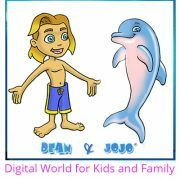 Dean and JoJo have played together and explored JoJo’s underwater world on a daily basis for decades. An avid ocean swimmer, Dean would swim out to JoJo’s favorite reef and they spend time together confronting sharks and exploring caves. After a while JoJo came looking for Dean. Many times he would find Dean kneeling on the ocean floor teaching a group of student divers. JoJo would hover behind Dean watching and waiting for him to finish teaching his class so they could play. However he soon became bored and tired of waiting for Dean and he would start disruptive antics. At first he would swim through the class and bump into the students. Then there was the time that he brought a sea turtle into the group but his greatest success was when he brought a shark and let it go in the middle of the class. Of course chaos ensued with students popping to the surface and swimming for shore. As JoJo’s popularity increased internationally so did the number of tourists coming to the Turks and Caicos Islands. Dean was eventually working full time to keep JoJo occupied far out at sea so that classes could be held without interruption. From then on their friendship deepened. They experienced adventure, fear, and humor as JoJo taught Dean about his world, its beauty and its dangers. In turn Dean taught JoJo about our world and its many dangers and about funny humans. JoJo is Dean’s closest companion.